Widely known on the classic bike circuit and at club runs and autojumbles, Barry Harper of Upminster passed away in January after being treated in hospital for a lung condition. His passion for bikes began when his father gave him rides around the garden on the tank of a single-seat 125cc Royal Enfield, and in the 1960s he graduated to occasional rides along the road on his father’s new Honda 50. A moment to cherish as Barry Harper picks up a show award for one of his BSAs. Barry passed his test at 16 on a Triumph Tiger Cub. An Ariel Leader and Norton Navigator followed before he spent a couple of decades away from motorcycles. 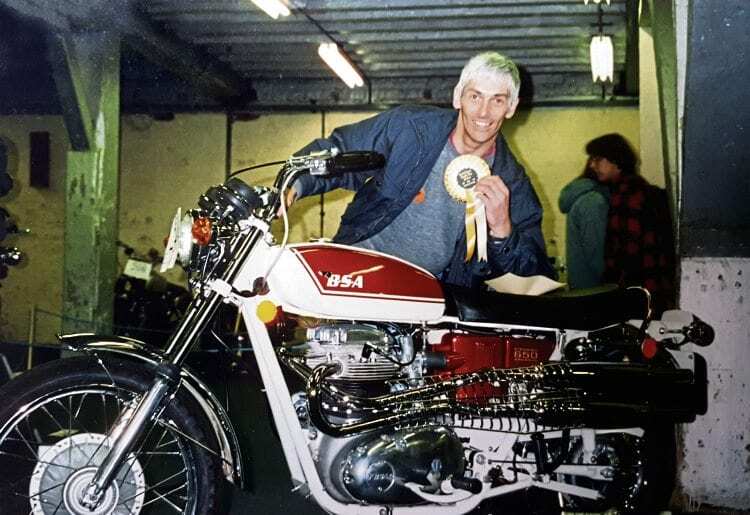 Returning to classic bikes in the early 1990s as a way of enjoying himself while raising a young family, he restored a 1971 BSA Firebird to concours condition, and it won awards at Bristol, Stafford and other shows. Becoming a little embarrassed at winning awards with the same bike, he restored a BSA Hornet that had been exported from the UK in the 1960s and used as a desert racer. He later picked up Mk III and Mk IV BSA Spitfires and a 1968 Firebird. Next Post:A chat between races – those were the days!